Uintatherium was an extinct genus of mammals that lived in North America during the middle of the Eocene epoch, between about 45 million and 40 million years ago. It was a herbivore (plant-eater) and believed to have eaten grasses, browsed leaves from shrubs, and probably also eaten swamp and marsh plants (it is believed to have lived near water). 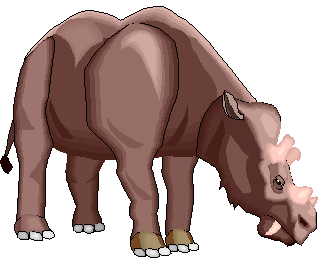 Uintatherium was about the size of a rhinoceros, and its most remarkable feature was its heavy skull with a thick cranium. Its upper canine teeth were enlarged (especially in males), and would have served as defense weapons, and males also had six horn-like structures ("ossicones") growing from the frontal region of the skull - these may have been used for defense, or perhaps to attract mates. On Uintatherium, Bathmodon and Triisodon. Contained in Proceedings of the Academy of Natural Sciences of Philadelphia Part II-October to December 1882 pages 294-300. Academy of Natural Sciences, Philadelphia, 1883.